Shadows: Awakening’s very existence is a bit of a surprise. 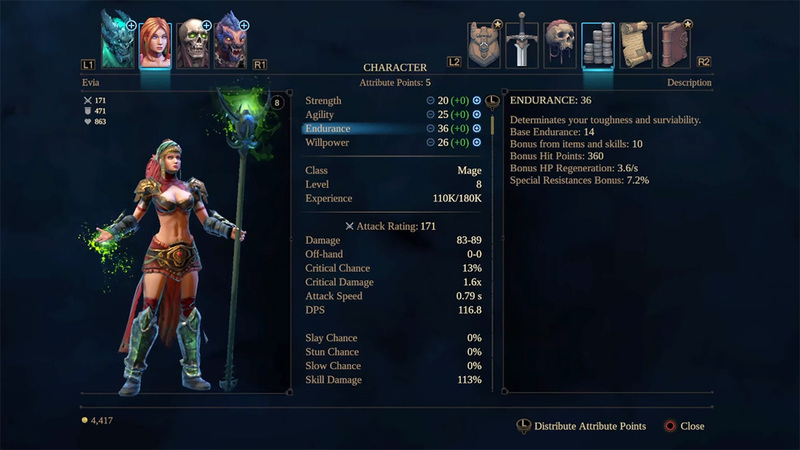 Back in 2014, developer Games Farm released Shadows: Heretic Kingdoms, a Diablo-style action-RPG that was supposed to be released in two installments. Unfortunately, Heretic Kingdom’s promised “Book 2” finale never materialized. After years of waiting, many weary fans accepted the story would never be completed. But then, lo and behold, Shadows: Awakening was announced! Part remake, part sequel, the first half of Awakening redoes Heretic Kingdoms, while the back half provides the closure fans have been holding on for. Best of all, you can download the game for free if you already own Heretic Kingdoms. It’s nice to see Games Farm finally delivering on their promises, but has the long wait been worth it? Or should this Diablo clone be sent back to hell? Shadows: Awakening opens with a mysterious mage named Krenze summoning a powerful demon, known only as the Devourer. Said demon has the ability to absorb and embody multiple souls as “puppets,” and the game immediately asks you to choose between three marks — whichever soul you pick will be your main character for the rest of the game. I went with Evia, a fire mage and imperial princess who died under mysterious circumstances over 300 years ago. You can also choose a warrior or archer if they’re more your speed. Each of the three characters have their own dialogue and some unique quests, so definitely take a second to consider before making your choice. Shadows: Awakening doesn’t do a great job of explaining its byzantine world or providing players with a clear motivation. Right off the bat, you’re hit with a deluge of history, lore, and wacky fantasy names, none of which mean anything without context. Broadly speaking, Krenze wants you to help him take down a secret council of mages known as the Penta Nera. These mages were once a force of good, overthrowing an oppressive Theocracy that once ruled the land, but now they’re dabbling in dangerous forces that could bring an end to the world. Shadows: Awakening’s story was mostly a blur to me. I went wherever the current mission marker told me to, and the machinations of the game’s largely-uninteresting cast of characters flickered by without leaving much of a mark. Gameplay-wise, Shadows: Awakening is, for the most part, your typical action-RPG. March through isometric dungeons while mowing down waves of enemies and collecting loot. You know the drill. That said, there are a few unique mechanics that set the game apart. You can instantly cycle between the Devourer and up to three puppets, each of which have their own strengths, weaknesses, and special skills. The Devourer can also explore the Shadowrealm, a dark alternate reality that differs from the regular world of Shadows: Awakening in key ways. A broken bridge may only be passable in the Shadowrealm or a previously-impassable door or barrier may conveniently disappear. You’ll also have to switch between worlds to solve some puzzles – the dark domain often contains symbols and other clues that hint at which path you need to take or lever you should pull. These puzzles (which don’t always require a trip to the Shadowrealm) aren’t terribly challenging, but they do break up the hacking and slashing a bit. 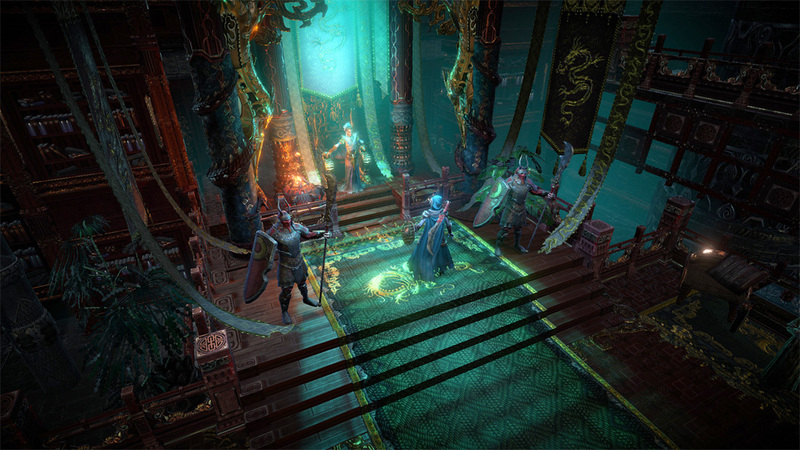 The Shadowrealm is also the only place to find certain important features – Sanctuaries, which let you revive characters and manage your party, Hexmarks, which award essences you can use to enhance your gear, the Shadow Trader, who sells special items and recharges your healing capabilities, and all-important warp points. Honestly, putting all the important stuff in the Shadowrealm feels like a cheap way to force players to visit it more often. The Shadowrealm isn’t a particularly fun place to hang around in – the enemies there aren’t terribly challenging, but there are swarms of them that tend to rush at you from all directions. Instead of feeling empowering, playing as the Devourer is mostly just hectic and annoying. I tried to avoid it as much as possible. Shadows: Awakening’s combat is fairly simple. Overly so, arguably. 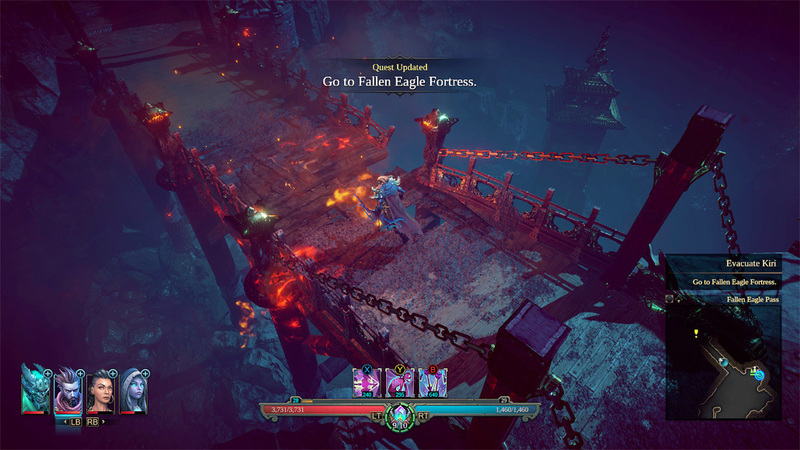 Characters feel slow and cumbersome, you can’t roll or evade attacks, and the game’s targeting system is unreliable when there’s more than a couple enemies on screen. Thankfully, the game’s AI is also pretty dim – stick and move and mash the basic attack button and you should make it through most encounters fine. If you pick a weaker, ranged main character like I did, expect to do a lot of backpedaling. Each character can assign three skills, from a list of about eight or so, and, admittedly, they’re quite varied. Some of are garden-variety “blast your enemies with a big fireball” attacks, but others let you unleash destruction from the heavens, summon a golem or the undead to fight by your side, or even transform your enemy into a frog. By rapidly switching between characters, you can combine their skills in interesting ways – weaken or incapacitate an enemy with one skill, then knock ‘em down with a powerful attack. This really comes into play during Awakening’s boss fights, which are fairly challenging, and require you to frequently cycle between characters and the Shadowrealm/regular world. Finding ways to create synergy between your party members and skills is the most entertaining part of Awakening. Shadows: Awakening is a relatively nice-looking game, that serves up a varied list of locales – you’ll journey through deserts, lush cities, dank sewers and catacombs, icy wastelands, and more. Unfortunately, Awakening is beset with technical issues on the PlayStation 4. The game suffers from frequent stutters and hitches, and its framerate chugs during busier battles. I also ran across a number of glitches, some of which forced me to restart the game. Shadows: Awakening should take most players around 25 hours to roll through. Add another 10 or 15 hours if you want to clean up all the sidequests. The game’s three main characters and multiple endings further extend replay, at least in theory. Awakening just doesn’t have the addictive draw of your better action-RPGs – I have a feeling most players will be content with saving the world once. This review was based on a PS4 copy of Shadows: Awakening provided by publisher Kalypso Media. You can purchase the game via Amazon for PC, PlayStation 4 or Xbox One. Shadows: Awakening presents a few interesting ideas and a surprisingly large, diverse world. Unfortunately, the game’s ambitious vision is undermined by a host of basic storytelling, combat, and technical issues. 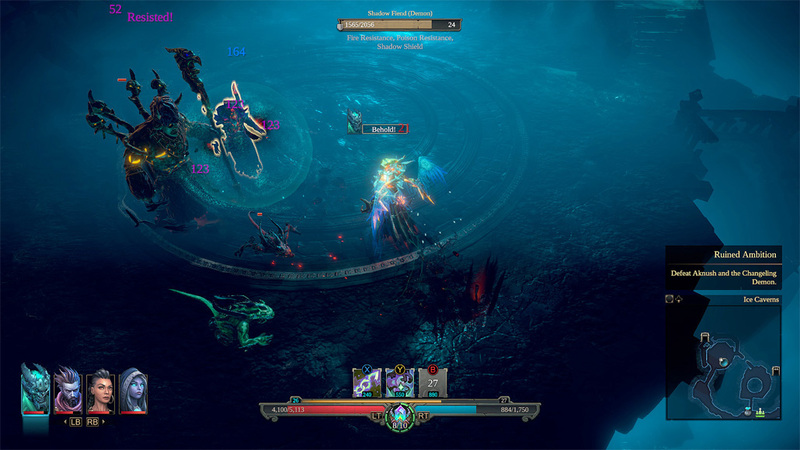 Those desperate for some fresh hack ‘n’ slash fun will find things to like about Shadows: Awakening, but the game is easily eclipsed by Diablo and any number of other, better, action-RPGs.